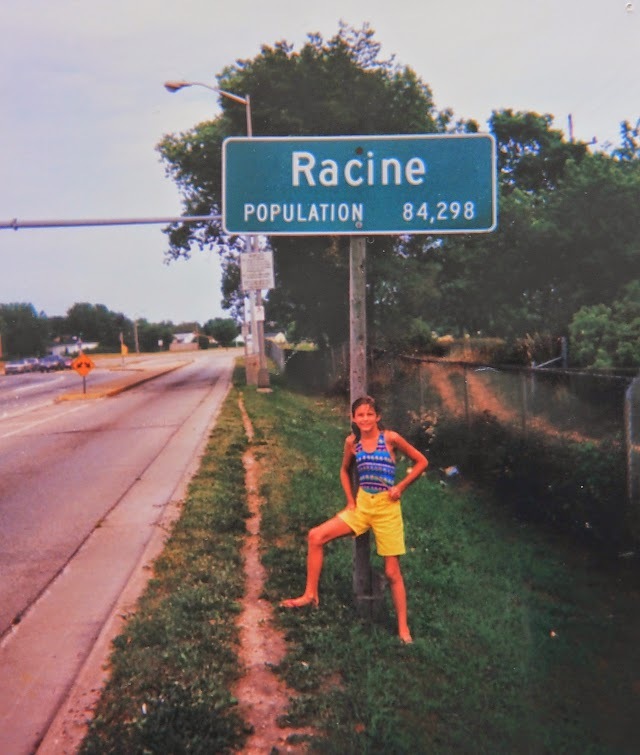 I was young, seven years old or so, when I learned about Racine. It was where my mother was born and, during the Great Depression, where my grandmother was born. It was where they were “from,” but I didn’t think much of it at the time. I was young and disinterested in family history, so Racine was just another distant city, like Cairo or Paris. I probably knew more about those cities than I did about Racine, honestly, because my knowledge was incredibly limited. I knew just two things—one, that Racine was built on a lake, and, two, it was where one could find kringle, the Danish pastry that was shaped like an oval and tasted like Christmas. Everything else was imagined, and “Racine” became a place that existed only in my mind, like “the Egypt and France of a child’s mind, filled with blurry visions of perfect pyramids, and warm sands, and Eiffel Towers, and something that people called ‘wine.’” I didn't understand. I didn't understand that my family’s roots were in a state to the east, in a city built on the shores of Lake Michigan. And I didn't know. I didn't know that Racine was where my ancestors, where my great-great-greats, were buried. Back then, I was too naive to believe in ancestry, history, and the abstract comforts of "home." To me, Iowa was "home." In fact, years later, Iowa is still "home." It's where I was born, it's where I spent my formative years, and it's where my mother and grandmother have lived for the last fifty-some years. But. But if you mention Racine to my grandmother, her eyes ignite. She speaks of her childhood, of her dad, of kringle from O&H Bakery, and of summer afternoons at the quarry. She has her memories. And, fifteen years after I first learned about Racine, I have some now, too. On the Fourth, after watching fireworks, Ty and I discussed what to do the following day: downtown Chicago or Racine? There were things to do and places to see in either city, so I was torn and indecisive, as always. "We'll just go to Wisconsin," Ty said. "I know you want to, anyway." His words were firm, but true. Had he suggested taking the train into Chicago, I might have protested. I was in the mood for looking into my family's past, after all. I thought of the lake, and of the quarry, and of the drawbridges over Root River, and I found myself nodding. "Okay," I said. "Let's go." We left the suburbs of Chicago late Saturday morning and got off the Interstate around noon. We took Highway 38, which turns into Northwestern and runs past the quarry and the sign announcing the city's population. As soon as I saw it, I remembered. I remembered yellow shorts, hair wet from swimming, and cicadas' omnipresent humming. I remembered walking to the quarry with my mom, who asked me to pose beneath the sign, and I remembered asking, "Is this bigger than Council Bluffs?" as I stared at the numbers. 84,298. That was sixteen years ago. It was 1998, and I was ten. The city was bigger then. Now, the population hovers around 78,000, and the numbers on the sign are different. But the road, Northwestern, was the same. It still led us right into the city, and right past the quarry. And I'll be damned if I wasn't going to see it again. The last time I had been to the quarry was August 2, 1998. Mom had etched into the sand our names and the date, and had taken a photo. Until recently, the photo had been forgotten, tucked inside one of the many boxes I keep under my bed. When I retrieved the images, I flipped through them, leaving thumbprints on the glossy corners. I flipped through them again. 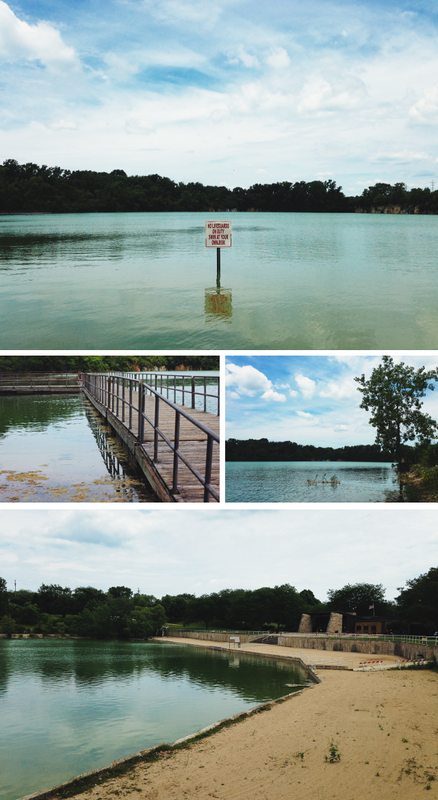 The water was a smooth teal, and young children and adults alike frolicked in its coolness. There were sunbathers and a lifeguard beneath a crinoline of red and white. And the beach. The beach was made of a rocky sort of sand, almost amber in color. And, if you intended to build sand castles or dig holes, you quickly found that, beneath the surface, the sand turned ash black. But that was sixteen years ago. When Ty and I first got to the quarry, I kept my shock to myself. The beach was gone. Gone, too, were the sunbathers and the waders, the young children and the rowdy teenagers. There was no lifeguard; there was only a red-lettered warning: SWIM AT YOUR OWN RISK. "This ... this is ... very different," I said. "Well, it looks like the water has gotten a lot higher," volunteered Ty. "Look at those trees over there." 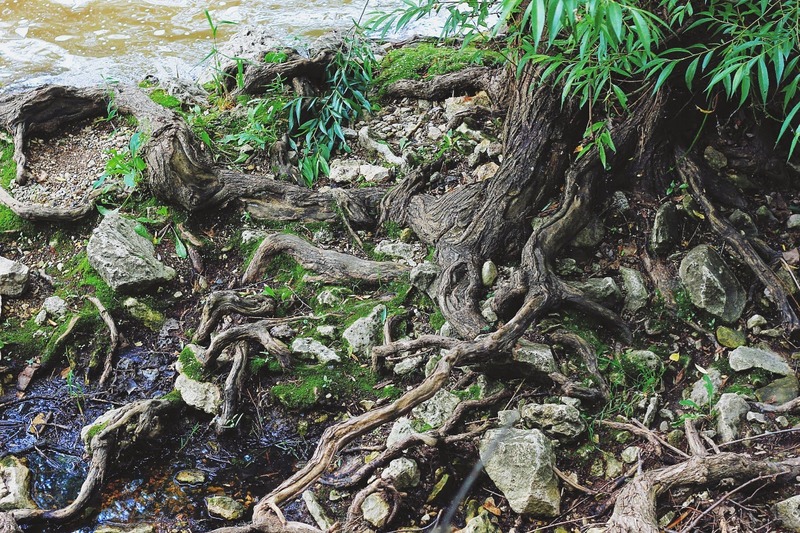 He pointed to the northeast side of the quarry, where a number of trees and plants appeared to be growing out the water. "That's not normal," he said. "But they have been getting a lot of rain up here." 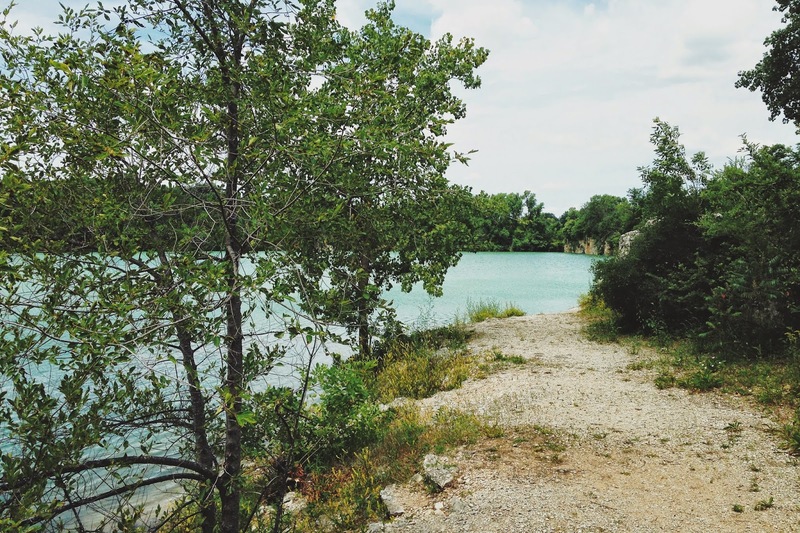 We walked around the outer edges of the quarry, on what had once been the "upper" level of the beach. I took off my shoes and dipped my toes into the water, half-hoping to see a fish lurking near the surface. "I remember swimming with them last time I was here," I said. 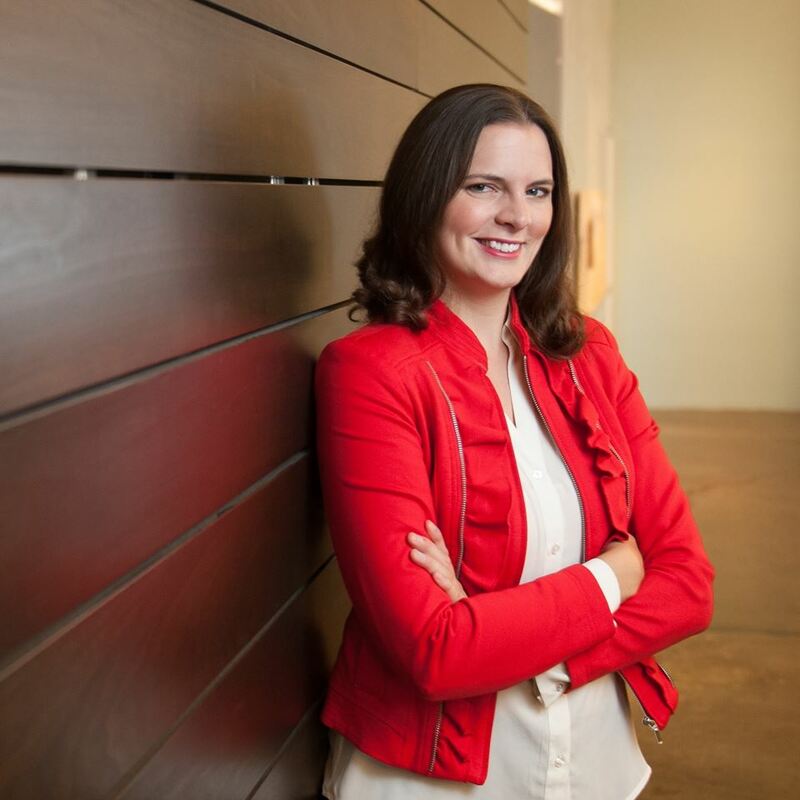 "They sort of tickled your legs and took you by surprise." A shriek of raucous laughter echoed behind us. I turned to look at the one family that had gathered at the picnic tables. 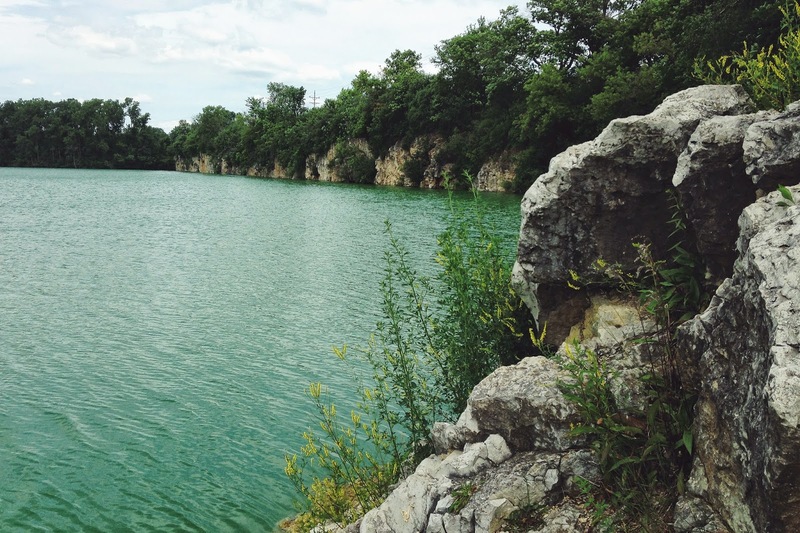 In the past, the quarry had been a place to go swimming, cliff jumping, and fishing. Now, it was quiet. The sand was without footprints, and was as flat and undisturbed as an Indiana cornfield. 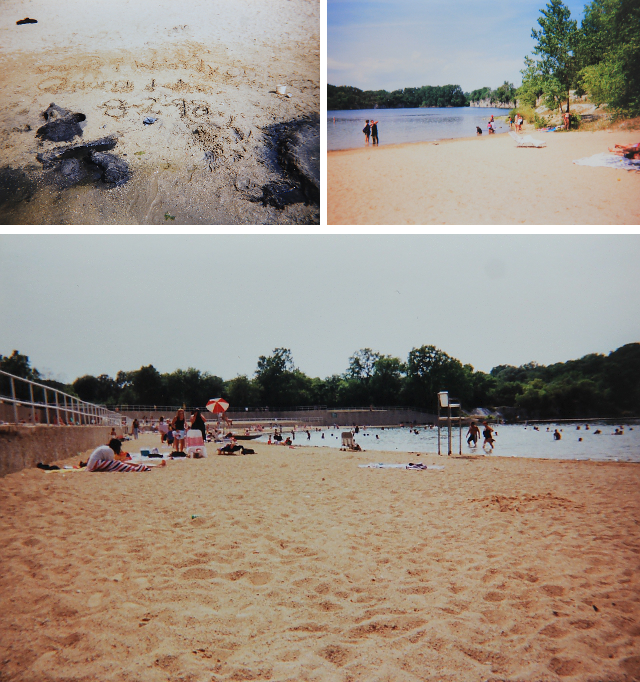 In the past, the beach had gently led visitors to the water. The slope was so subtle that—had you been happily lost in conversation—you might have found yourself waist-deep, with fish tickling your toes, and with no recollection of how you got there. It was just too harsh, now; you were either on land or in water, minding the discarded bottle caps or minding or the sign. SWIM AT YOUR OWN RISK. I wondered if the quarry's decline in popularity was attributed to Racine's crime rates, or its location in town. I didn't know. I just had my hunches. As we walked, we met a man strolling in the opposite direction. "Afternoon," he said, nodding. "I gotta figure out how to get that basketball back," he said, pointing toward the water. "And I can't even swim." As we had no change of clothes, we offered our apologies. The man shrugged. “No worries. It’s a beautiful day, though, isn’t it?” We agreed, and began walking toward the southwest side. "That man had an ankle monitor," Ty said matter-of-factly. "Huh," I muttered. And that was that. We found our way to the banks of the Root River, where Ty suffered a muddy slide. 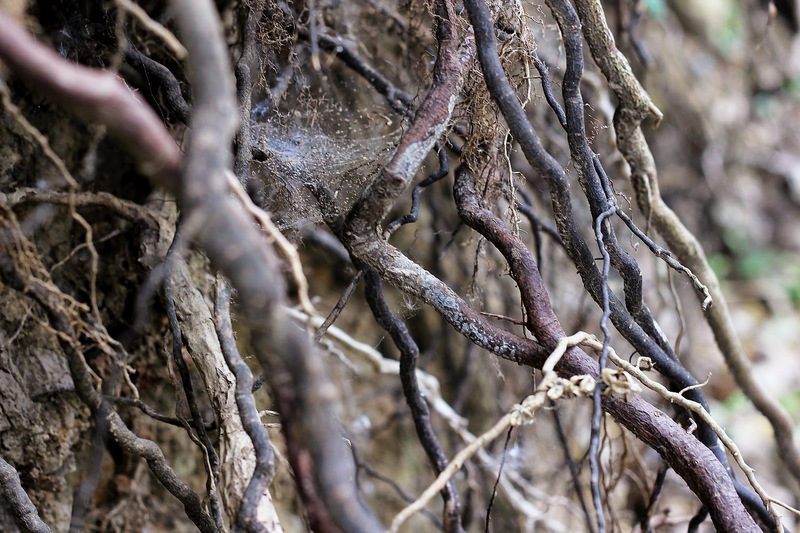 We took a few pictures and gandered at the twisted roots of trees. And we threw sticks into the water, just to see them float. And with one last solemn look at the quarry, we were in the car and on our way. To the church where my mom was baptized, to the home where my mother was born, to the house my grandmother grew up in. Lawson, Jenny. Let's Pretend This Never Happened. New York: The Berkley Publishing Group, 2012. Print. Page 116.